People working on peacebuilding and accountability in Burundi, Central African Republic and South Sudan should look to the experiences of neighboring countries in the region. Some approaches have worked, but others have contributed to delays and political backlashes. There are also successes to learn from, like efforts by local groups in the DRC to document abuses and in Uganda to empower women victims. Countries in Africa’s Great Lakes region share the same colonial history and challenge of building a stable democracy from a legacy of violence and economic exploitation. They also share modern histories of armed conflict, which are often interlinked and triggered by common problems like bad governance, struggles for political power, inequitable distribution of national resources, marginalization and ethnic divisions. Given the interconnectedness of violence in the region, each country’s attempt to tackle the root causes of conflict within its borders and provide justice to victims for past human rights violations is linked to similar processes in other countries in the region. For instance, it matters in the Democratic Republic of the Congo whether the Ugandan government holds to account insurgents from the Lord’s Resistance Army or the Allied Democratic Forces for alleged abuses. Because of this, when looking for ways to solidify peace and prevent further abuses in countries like Burundi and South Sudan, where vicious fighting persists and the threat of genocide remains high, efforts to deal with histories of violence that have taken place or are currently underway in the region can be instructive. In the last decade, Great Lakes countries, including Uganda, Kenya and the Democratic Republic of the Congo, have paid lip service to taking concrete steps to deal with legacies of massive violations of human rights. However, all too often their efforts to fulfill those commitments have been significantly delayed or contested, or simply not carried out with a genuine intention to succeed. Those leading peacebuilding efforts in Burundi, the Central African Republic and South Sudan need to know what has worked well and what has not in promoting truth, justice, reconciliation and acknowledgement regionally. They should collaborate, share information and work collectively to ensure peace and prevent future atrocities. One key issue is how much can be done when and what conditions are necessary for success. There is a school of thought that suggests there is special value in applying a combination of measures, including criminal prosecutions, a truth commission, reparations programs, and reform of laws and institutions, at once in an “integrated” way. The argument is that, taken together, these measures add up to more than the sum of their parts. But the “integrated” theory has often led to a one-size-fits-all approach to justice that does not sufficiently ask the right questions about what fits the particular needs and circumstances of a society. In countries like Kenya, for instance, where there has not been an effective political transition and where alleged perpetrators of human rights violations still wield significant power, it may not be possible or wise to pursue an “integrated” approach. We have seen how political ambivalence toward one effort, like prosecutions, can delay or derail others that may be less politically sensitive. Similarly, the lack of political will in Uganda to carry out official truth seeking has contributed to delays in adopting a comprehensive National Transitional Justice policy, which would provide funding for reparations and steps to strengthen community-level justice. Those working on these issues should consider, first, that it may be more pragmatic to adopt an incremental approach to justice, focusing on modest, but impactful, steps that can provide some effective, albeit partial, responses to victims in the short term and lay the foundation for future long-term efforts. These include collecting and preserving information about past violations and community-based truth telling and memorialization that honor the memory of victims, promote reconciliation and urge society at large to reflect on its legacy of violence. At the same time, however, criminal justice, truth commissions, reparations and reform programs should not be seen as substitutes for each other. They all do different things, in different ways. Second, justice efforts are unlikely to succeed without the dynamic involvement and input of victims and civil society from the beginning. Inclusive peace processes centered on victims’ rights, which consider the experiences and interests of affected communities, are crucial to finding lasting solutions to triggers of conflict and building sustainable peace. Last, the regional nature of many conflicts requires civil society groups to work together within and across countries to share lessons learned, advocacy strategies and innovative approaches to promoting victims’ rights and overcoming challenges. It is important to emphasize that where the government has so far failed to respond to victims’ needs, civil society groups have stepped in to fill the gaps, with assistance like psychosocial support for victims and community-based truth telling and memorialization. In Kenya, for example, civil society groups have been vocal in demanding accountability and redress for victims of political violence. And work by local groups to document gross violations of human rights in places like the Democratic Republic of the Congo has been crucial to preserving vital information for possible future trials. Greater cooperation between states based on regional legal frameworks, like the International Conference on the Great Lakes Region Protocol on Judicial Cooperation, could also play a role in helping to end cycles of violence that destabilize the region. Ending endemic violence in the Great Lakes region requires taking steps toward acknowledgement and accountability that are grounded in a deep understanding of the social and political reality and the interests of victims. 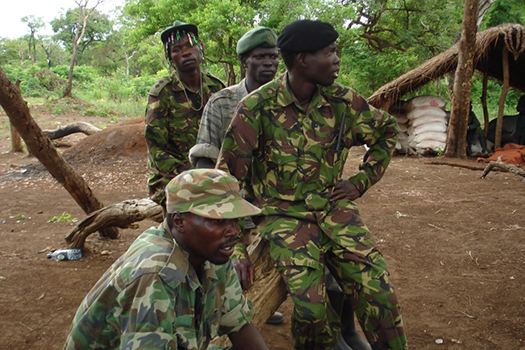 As the Central African Republic and South Sudan contemplate establishing transitional justice measures, they can learn a great deal from the experiences of their neighbors. This article first appeared in Pambazuka News.